You never know what you might discover at the end of a dirt road. There is something special about the draw of the unknown, especially if it is a paradise to be discovered. I thought I had died and gone to heaven when I first discovered the Mayto beach area. That was a few years ago when the road was a lot more challenging than it is today. I have had more than one person ask me where I was taking them, on the trip down from Puerto Vallarta. As soon as we arrived and got onto the beaches, they knew and had a smile on their face. This whole area of Cabo Corrientes is what I think of as one of the last frontiers of Mexican coast just waiting to be discovered, or I should say developed. I suspect that a lot of the prime coastal land is already being held until the time is right. That time may be near. We are in a new cycle of interests in real estate, development, and demand. The dirt road attracts the explorers, followed by the travelers, and eventually the tourists show up when everything is in place for them to easily see. Tourists will not be here anytime soon, and that is why this area is so special. Imagine sweeping vistas of beach as far as the eye can see. No vendors, very few people other than the locals from the villages that dot the coastline. 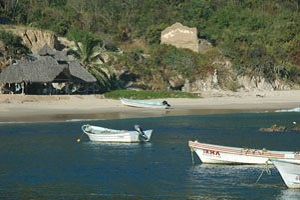 I love to recall my first impression of the fishing village of Tehuamixtle – just past the community of Mayto. Cresting at the top of the road, I could see the Bay of Tehua with pangas, the open fishing boats, bobbing in the water, a few buildings, the large headland with its rocky shore, and a feeling that I might be approaching an Italian coastal village. My friends and I settled into one of the three beach restaurants and ordered a round of cervezes and a large platter of fresh sucked oysters, we followed that with a large whole fried snapper, octopus salad, and more cervezas. The setting was magical sitting under this grand palapa with our feet in the sand at one end of the amazingly beautiful bay. We did not want to leave. Sleepy would be the best description of Tehuamixtle. The place just puts you in another state of mind. 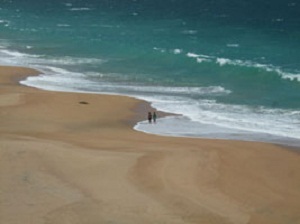 It also, has a wonderful beach that is ideal for a swim or snorkeling. This is where I made my decision that I had found my special place in the sun, and have since developed Chachalaka on the beach nearby. The dirt road still exists, however it is gradually being surfaced. The trip here takes about two hours from Puerto Vallarta. That is not bad considering the reward when you arrive. 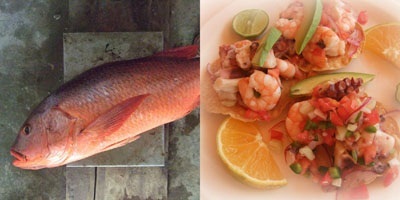 From my perspective, Vallarta is just an easy drive, when I need a bit of big city, some shopping, and some fine dining. However, it is always good to get back to paradise at the end of the dirt road.